Polar Explorer's Day is one of the numerous professional holidays, that are celebrated in Russia. This is a new holiday, that was officially established by the Presidential Decree in 2013. Polar Explorer's Day is annually observed on May 21, on the anniversary of the establishment of North Pole-1, the first Soviet manned drifting station in the Arctic Ocean in 1937. Polar Explorer's Day was initiated by member of the Federation Council Artur Chilingarov. His initiation was supported and President of the Russian Federation Vladimir Putin signed a decree. The holiday gained an official status. The drifting station North Pole-1 was the world's first Soviet polar research drifting station. It was officially opened on June 6, 1937, but it started operating on June 21 of the same year, when the first members of the polar expedition were landed on ice. 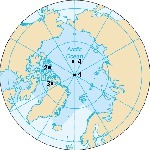 North Pole-1 operated for 9 months, during this time it drifted 2,850 km. The station was headed by Ivan Papanin, polar explorer and scientist. The other expedition members were geophysicist Evgeny Fedorov, radioman Ernst Krenkel and hydrobiologist Pyotr Shirshov. Four polar explorers and the pilots who took them to the station were awarded the Hero of the Soviet Union title.